Grand Central Terminal opened on the 2nd of February, 1913, with its very first train leaving at 12:20. Many people still call it Grand Central Station; the name of the former railway station that occupied the same spot. 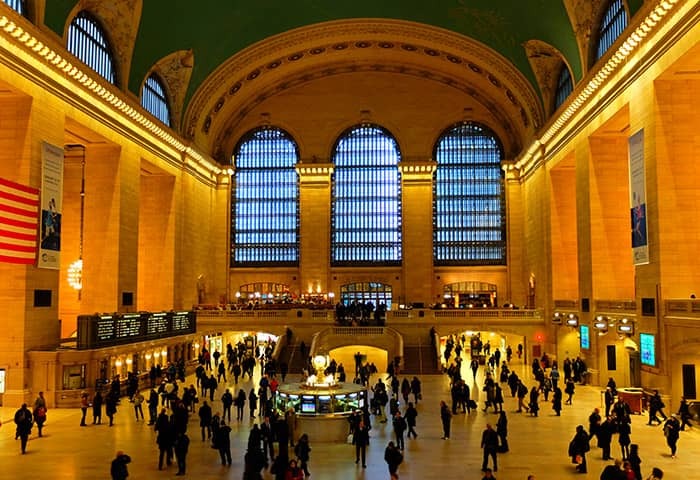 Others refer to it as Grand Central, which is, the name of the subway station on 42nd Street. 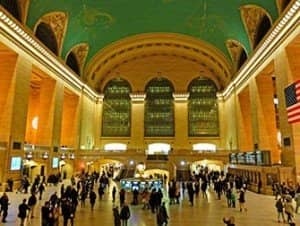 Grand Central Terminal is the worlds largest train station and certainly worth a visit. It consists of an impressive 44 platforms and 67 tracks in addition to a number of restaurants. Most people though come to see the Main Concourse in all its grandeur – and it is splendid! Open daily from 05:30 to 02:00 it is located at East 42nd and Park Avenue. Take subway lines 4,5,6,7 and S to Grand Central (42nd Street). When the current building was erected, the surrounding streets were provided with electricity. This made the area one of the most desirable districts for commercial offices. When inside, an eye catcher is the large American flag, hung a few days after 9/11. 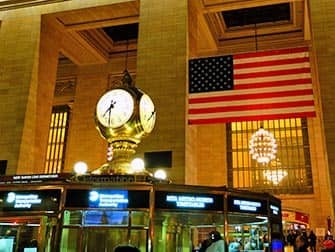 However, perhaps the most notable icon of Grand Central is the four-faced clock atop the information booth. With each face made of opal, the grand clock is estimated to be worth between 10 and 20 million dollars. Each day over 750,000 people travel through the station of which 93% of those commuting are college graduates. With that many people making use of the station, it is surprising to see it in such pristine condition today. This wasn’t always the case, as extensive interior and exterior renovations have helped restore the building. 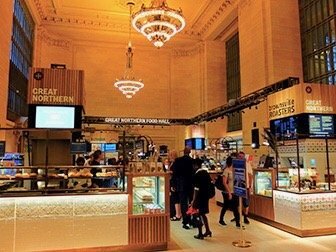 For a long time now, Grand Central is not only known for being a transportation hub. These days, there is a diverse range of shops, restaurants and even a food market within the terminal. For your Apple products you can head to the Apple Store that looks out over the Main Concourse. To get to the store, take the stairs to the East Balcony. 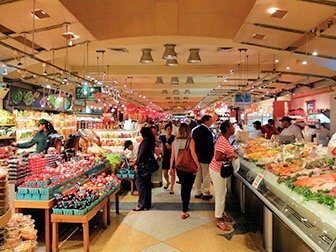 On the ground floor, there’s Grand Central Market. A market offering locally produced goods, such as fruit, coffee and bread. If you prefer your food made for you, the Great Northern Food Hall is perfect! This food market, located in the Vanderbilt Hall, has a wide variety of stalls offering dishes hailing from Scandinavia. Eric’s Tip: If you want to visit Grand Central Terminal it’s a good idea to go either early in the morning or at the beginning of the afternoon. Then you can go straight for breakfast or lunch. 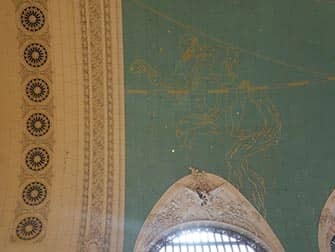 When visiting Grand Central, be sure to look up at the ceiling. After 12 years of restorations, a beautiful decorated astronomical ceiling was revealed to the public – something which was completely hidden beforehand by tar and nicotine from tobacco smoke. A little patch above the Michael Jordan Steakhouse has been left to remind visitors of the grime that once covered the ceiling. The painting itself, however, has two rather large errors: the sky is backwards and the stars themselves a little displaced. To account for this, some have argued that the sky is backwards because this is how God would have viewed it from above. The stars themselves are slightly misplaced due to the design being based on a mediaeval manuscript. Be sure to tell this fact to your children when visiting Grand Central, it’ll surely impress them. Another thing that will impress the kids, or flatter that special someone, is to have fun at the Whispering Gallery. On the dining concourse, near the Oyster Bar, the ceramic arches make a whisper sound like you are shouting across the room to each other. You will need two people to do this, each standing at opposite ends of the arch, face the corner and whisper. You’ll be surprised what you hear! Lastly, you can impress your companions with facts about the building itself: Did you know, for example, that there is a secret platform (track 61) leading directly to the Waldorf Astoria, that President Franklin D. Roosevelt once used to avoid pesky journalists?